David Bernstein posts a copy of Ayanna Pressley's first speech on the floor of the House. 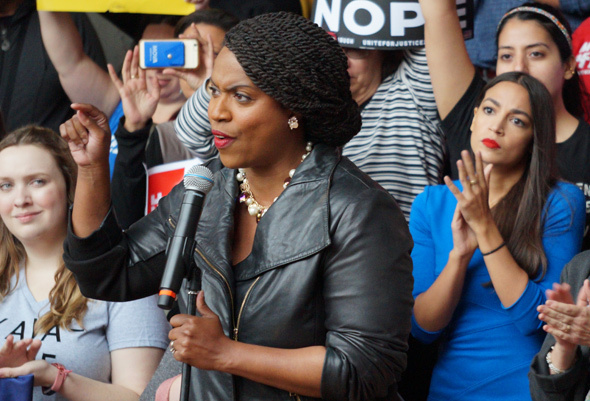 Speaking of Boston and future congresswomen, here's our own Ayanna Pressley reading from Maya Angelou's "On the Pulse of the Morning" back when she was still a city councilor: Read more. In an 11-0 vote (councilors Flaherty and Zakim were absent), the city council said today it supports passage of Question 3 on the November ballot, which would enshrine transgender people's rights in places of public accommodation - from restrooms to hospitals. Read more. The New York Times takes note of the Congressional Black Caucus and Deval Patrick endorsing Pressley's opponent, incumbent Mike Capuano - and John Lewis's trip to the Twelfth Baptist Church in Roxbury to speak for Capuano. The Dorchester Reporter breaks the news. City Councilor Ayanna Pressley (at large) wants to ask the state legislature to give Boston the ability to issue 153 new liquor licenses, mostly in neighborhoods not served by cash-rich outlets of national chain restaurants - and to issue "umbrella" licenses that would allow unlimited numbers of alcohol-serving eateries at really big developments in the city, such as the South Bay Town Center now opening up in Dorchester and the Seaport Square project under development in South Boston. Read more.